Combine the yogurt and the raw honey in a small cup or bowl. Combine the peaches, apricots and other fruits in a large bowl. 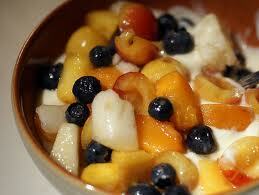 Add the yogurt mixture to fruit and mix gently. Serve.